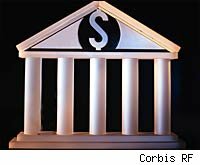 It could be a very interesting day for banks, as the U.S. Treasury's process to provide a "comprehensive analysis of the assets on the books of 19 of the largest U.S. banks" comes under scrutiny. The details of this process are expected to be released today, and may "aggravate speculation about bank performance before the scheduled public release of the results on May 4." It is believed that this process will help identify the institutions that are at the greatest risk of failure should the economy slink further into a recession. Critics argue that this entire process is flawed and will do little to help instill confidence in banks. Mike Holland believes that these stress tests are "at best, a waste of time," and "at worst [...] misleading and testing the wrong things." With criticism of this ilk surfacing across the Street, bank regulators are hoping to lighten concerns about the test by releasing some details today. The problem is that many investors wonder how the Treasury and bank regulators can even forecast what may take place in the economy. Reports suggest there is a computer-generated model that supposedly can forecast and identify potential problems, but many argue that forecasting any problem is impossible. In fact, some are comparing these tests to a "doctor [trying] to gauge the health of your heart by setting a treadmill to a leisurely stroll." I don't know about you, but if it is my heart being tested, I want to make sure it is the toughest test I can face. While a good portion of these stress tests have drawn the ire of critics -- for good reason -- the actual idea behind the stress tests isn't all that bad. If there were some way to account for all the mitigating factors in the economy, this kind of test could be great and very informative. I agree with Richard Bove who stated, "The stress test was done to prove to the public that the banks are in good shape, because the government simply cannot come up with more money to put into the banks." Bove continues to note that the "net effect of it is a sham. It is a political game." These stress tests do not take enough factors into consideration and could lead to a loss of confidence among investors, depositors and bank customers. As the article notes,"It's as if someone offered you ten glasses of water with a warning that one of them is poison, but won't say which one it is. You'll lose your thirst in short order." When the results are given, we could see the banks determined as "bad" suffer greatly and ultimately fail. A stress test is good, and it may even be needed. However, the problem lies in the methodology and the sharing of the results. These tests could end up doing far more harm than good.